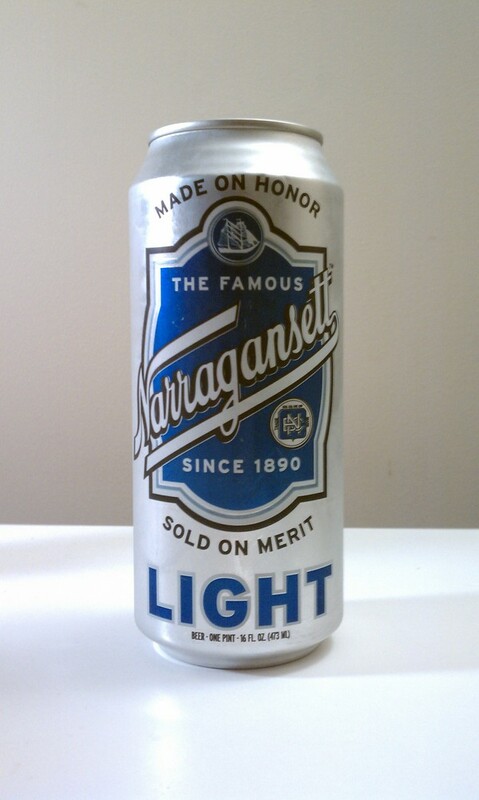 Today I will be reviewing Narragansett Light beer, I loved the regular lager but how will its light version rate. I am not typically a light beer drinker but I had a bud light or few back in my college days. To review this one I will compare it against Bud light as a baseline. The pour of the light beer is beautiful. It lands in the glass and creates a fluffy cloud of ivory white foam on the top of the glass that is short lived. The beer is very clear and is a light amber straw color. The smell is extremely malty and of slight hops on the nose. The carbonation is on the averages size. The taste is almost exactly what I detected in smell. Both the malt and hops notes are extremely light. The finish is some what dry and somewhat bitter. This beer is very drinkable still however. It’s a beer for a good pub pizza, a day on the lawnmower, or pacing yourself during a football day or in multiple rounds of beer pong. I probably would not buy this one again, but as I stated I am not a light beer drinker. If I could give it grade it would receive a B-, and may occasionally be in my fridge for guests that drink light beer and for parties and mixed bomb drinks. Although I wasn’t wow’d by this light beer, I didn’t really expect to be since I am used to much stronger and more complex full calorie brews. I still highly recommend you check out the Gansett Lager and I will be reviewing the upcoming Gansett Porter when it lands in a few weeks.